Earlier this year Sport England launched This Girl Can – an edgy promotional campaign that seeks to inspire women to challenge cultural assumptions about femininity, that prevent them engaging in sport and exercise. The national campaign features ‘real women’ around the UK as they wobble, jiggle and move while working out. Vanessa Lavender, 40, from Findon, believes she’s Worthing’s very own example of these inspirational women and is keen to tell her story about enjoying exercise, fitting it in with busy family life and letting go of fear of judgment. In January this year, Vanessa joined Your Next Move Fitness, a new Worthing based fitness group founded by passionate local athletes, Emma Macready and Martin Footman. 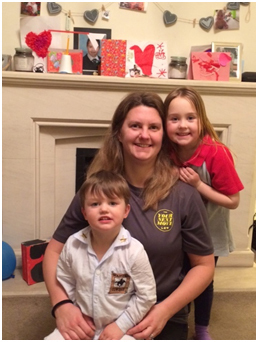 Vanessa attends two weekly sessions with the group and enjoys swimming at the weekend with her two children, Annabel aged five and Benjamin aged three. “I’ve always liked the idea of getting in shape and one day improving my fitness, but trying to fit it in when you have two young children is not easy! “In January I saw the advert for YNM Fitness on Facebook and thought, what the hell it’s round the corner from me, it’s a new year, I’ll give it ago. From the first session I absolutely loved it. Emma and Martin are great and really spur you on, just when you need it. They’re not pushy and want me to do my best but enjoy myself too. I’ve made some great friends in just two months and feel at ease every session! “During my first week of YNM Fitness I saw the This Girl Can campaign. Straightaway I loved it and could see me and a few other YNM ladies in those fab inspirational women. The campaign hits the nail on the head! Yes it is intimidating going to a fitness class for the first time when you know you’re not a super model and yes, there are bits of me that might jiggle when I wish they didn’t. This aside, the campaign really showed me that no matter what shape or fitness level it is possible to have fun and be happy exercising, overcoming any barriers you might have personally. For further information about YNM Fitness follow @YNMFitness on Twitter. Watch the This Girl Can video here http://www.thisgirlcan.co.uk.